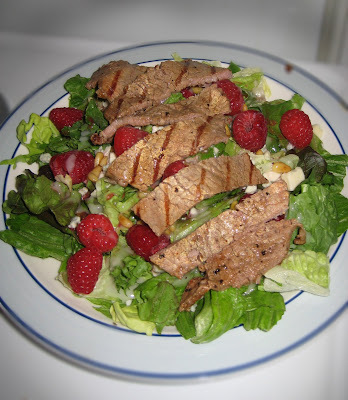 Flank steak, medium grilled, over a 7 salad blend. Featuring home toasted pine nuts, raspberries, blue cheese, and paired with a raspberry vinegrette and a poppyseed dressing. I love salads in the summer - that looks awesome! Yum! I'm obsessed over fruity salads these days. Did you make the dressing from scratch? Seriously, this salad is always on my mind. It's so super yummy and light on the tummy! The flank steak is a thin, lean cut. Soft cheese has less fat and calories than hard, of course you can't go overboard! And the dressings are both reduced calorie! Andrea - I really should invest some time in making my own dressings, but sadly, I didn't not whip these ones up.